SEOUL, South Korea (CNN) -- North Korea has fired another short-range missile, the South Korean Yonhap News Agency reported on Wednesday. 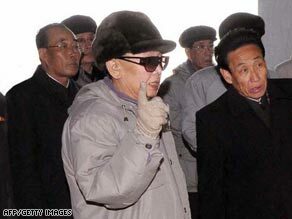 North Korean leader Kim Jong-II is suspected to have suffered a stroke last August. The agency cited a government official who said that the missile had been fired into the Sea of Japan, the latest in a series of tests that began two days ago. North Korea's actions have heightened tensions in the international community, though U.S. officials made it clear that other nations will not be intimidated by the "provocative and destabilizing" missile tests, particularly the nuclear test on Monday. The U.N. Security Council -- which includes North Korea's closest ally, China -- on Monday unanimously condemned Pyongyang's nuclear test as a "clear violation" of international law. A day later, North Korea fired two short-range missiles from its east coast in what one South Korean official called a continuation of the North's "saber-rattling," Yonhap reported. After passing the non-binding statement of criticism, the Security Council is now working on passing "a strong resolution with teeth," Rice said. "Those teeth could take various different forms -- there are economic levers, there are other levers that we might pursue," she said. North Korea first tested a nuclear weapon in October 2006. Pyongyang had threatened last month to carry out a new test after the Security Council condemned its test-firing of a long-range rocket and extended economic sanctions against the nation, which is in dire need of food and energy assistance. Russia, France and Japan have signaled support for new sanctions against North Korea, already one of the most isolated nations in the world. Monday's blast, conducted just before 10 a.m. (9 p.m. Sunday ET) showed up on seismographs with the punch of a magnitude 4.7 earthquake, according to the U.S. Geological Survey. Russia estimated the force of Monday's blast at 10 to 20 kilotons, in the neighborhood of the Hiroshima and Nagasaki bombs of World War II and far larger than the 2006 test. Less than three weeks ago, the White House announced a new diplomatic effort to restart the stalled six-party nuclear talks. The discussions involve China, Japan, North Korea, Russia, South Korea and the United States. Several analysts said the test could be an effort to improve Pyongyang's bargaining position, or a sign of a power struggle within North Korean leader Kim Jong-Il's government. Han Park, a scholar at the University of Georgia, said North Korea wants normal diplomatic relations and a non-aggression pact with the United States -- and is "angry enough and hungry enough to sell anything they can put their hands on." "They are a big-time weapons trader," Park said. "If we are going to try to do something about nonproliferation, we have to include diplomatic relations with North Korea." Analysts say North Korea is years from having a weapon it can put atop a long-range missile like those in the U.S., Chinese or Russian arsenals. Meanwhile, Kim is widely reported to have suffered a stroke in August and has been absent from many public functions in recent months. In April, he named his son Kim Jong-un and brother-in-law, Jang Song Thaek, to the country's powerful National Defense Commission, suggesting his son might be his heir. Rebecca Johnson, executive director of the Acronym Institute for Disarmament Diplomacy, told CNN that Kim "needs to demonstrate domestically that he is in charge." "Doing the nuclear tests, firing a couple of missiles, is a way to do that -- perhaps the only way to do that -- because he can't feed the people," she said. North and South Korea technically remain at war, because no treaty formalized the truce that ended the Korean War in 1953. The conflict also involved China and the United States, and about 25,000 U.S. troops are still based in South Korea. But Johnson said renewed conflict is unlikely; rather, Pyongyang is "playing a political game." "It causes a lot of anxiety in South Korea and Japan, but they are sensible countries," she said. "They know that this can be dealt with politically and diplomatically. This is not a situation where anyone should start saber-rattling and threatening to go to war." CNN's Sohn Jie-Ae, Jaime FlorCruz, Matthew Chance, Per Nyberg and Morgan Neill contributed to this report.